Less than 2 weeks to go now so here is my final update on my upcoming charity photo exhibition and sale. 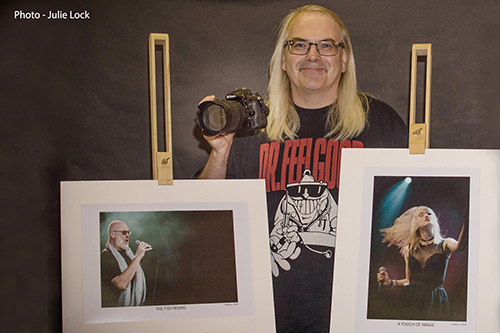 Kindly sponsored by Presto Music this is an exhibition of some of my favourite images from my years of gig photography consisting of 40 prints and 40 digital images and includes over 25 unpublished shots. Bands and artists represented (with still a few to add) include UFO, Thin Lizzy, Dr. Feelgood, Joanne Shaw Taylor, Magnum, Marillion, Fish, Kristy Gallacher, Steve Hackett, Mostly Autumn, Voodoo Vegas, John Otway, Heather Findlay, Cherry Lee Mewis, Europe, Laurence Jones, Touchstone, Larry Miller, Uriah Heep, Hayseed Dixie, Robinson-Stone and several local acts. There will be short sets by two of my all time favourite performers and good friends Steve Walwyn and Kristy Gallacher during the evening and I have put together a playlist of some of my favourite numbers by artists portrayed in the exhibition. Every penny raised on the night will be split between my 2 chosen charities. ZOE'S PLACE - A baby hospice based in Coventry providing palliative, respite and end of life care to babies and infants aged from birth to five years. THE CINNAMON TRUST -The National Charity for the elderly, the terminally ill and their pets. There are several ways you can help donate on the night by contributing to the charities collection boxes (would be a nice thank you to my guest musicians giving their time and skills for free), the purchase of raffle tickets at £2 a strip and if you take a shine to one of the prints (A3 photo mounted) they will be for sale on a first come first reserved (paid for) basis and available to take away after 10pm or to collect later in the week for a special price of £20 each. Magnum, The Cinnamon Trust, Julie Lock, Laurence Jones, The Classic Rock Society, The Tom O’ The Wood, Cherry Lee Mewis, Jo Ash/Derecho, Voodoo Vegas, Kristy Gallacher, Matilda Pratt, Audrey Pheasey, John Otway, Hug Life Living and Robinson-Stone. (hope I have not missed anyone out). Thanks as well of course to Jeff and Sarah at The Oak House and the club itself, my sponsors Presto Music, my wife Julie for her help with the prints, Malcolm at the Catalan for a potential offer of a small PA for the evening and everyone else that has helped including the places that kindly displayed my flyers. Hope to se some of you there and nice and early would be advised in case it fills up (never know!) and you can also have first choice if want to buy a print and I would love time to chat with anyone about what has been a most enjoyable little hobby for the last 11 years.